Are YOU ready for Father’s Day? Or maybe you are the father being celebrated, but you aren’t sure if your kids are choosing wisely? Well Highland Woodworking is here for you, whether you need to get a gift or drop some hints. 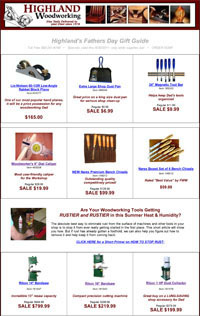 Our 2011 Fathers Day Gift Guide offers over 30 gift ideas, and all of the specials are valid through June 30th. With great deals on our new premium Narex bench chisels, our compact, precision-cutting Rikon 10″ bandsaw, or our new woodworking project kits for kids (a great way to build something together! ), we’ve got lots of ways to make this a great Fathers Day. Start looking now, only ten days to go!